I love that with Sonlight, I don't have to create all kinds of activities for my children. I read the books, and they live out what they've read. They've been Irish potato farmers fleeing a famine, Celts or Vikings or Knights, Civil War spies, pioneers on the Oregon Trail, and Greeks and Trojans with the girls as Amazons. I watch in delight from the window and send out food and water when requested. Here, Christian (7) and Nathanael (4) stop to pose as Celts on a raid. Katherine is using one Core with her four school-age children in their second year of Sonlight. 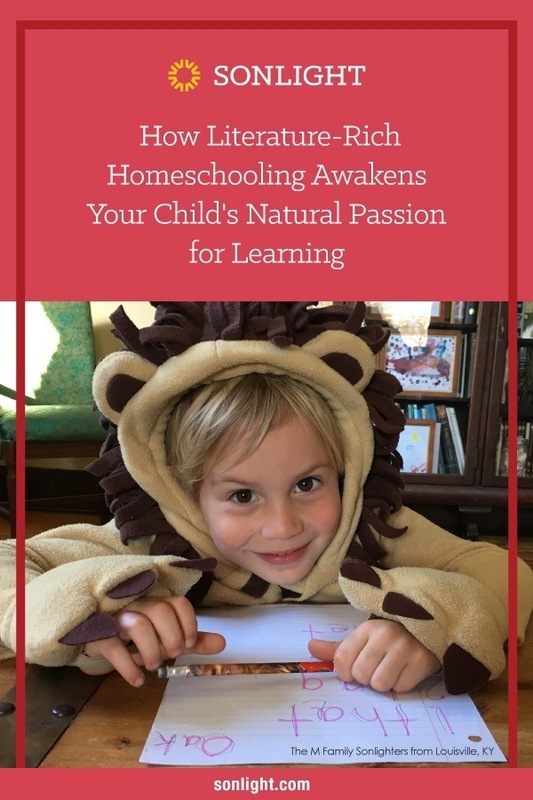 Sonlight Curriculum is unique compared to most other homeschooling companies because we include so much high-quality literature in our curriculum. Where others choose to rely on textbooks and other educational media, we opt for great books and delightful stories that will capture children's imaginations and instruct them at the same time. Many parents struggle to get their kids to talk to them. But when you use literature as the foundation of your curriculum, you'll find it's much easier to spark conversations. Good conversations. Significant conversations. When you use a literature-rich program like Sonlight Curriculum, you'll read aloud to your children. As you do, your children will ask questions about the story, about the characters, about words they may not have encountered before. The literature-rich approach provides the context; it communicates information in the midst of a story. You can't miss the drama because "you are there." You feel the pain. You grieve the losses.... You are there, in the thick of things. And you understand and remember. Maybe not the exact dates. But you remember the years, or the general places and times in history. Because you understand the broader context. Some people wrongly assume that using a literature-rich curriculum is "too hard." They feel overwhelmed by the number of books we include in our curriculum. They feel hesitant to teach their children real history using fiction. And they feel ill-equipped to deal with the broad range of situations and issues they'll encounter during the year. 1. "It will take way too much time to teach using a literature-rich curriculum. It will take far less time to leave them in their classroom school, hand them a textbook, or put them in front of the computer." 2. "I couldn't possibly teach my kids — and, most especially, teach them history — using literature! Textbooks, workbooks and computer programs may offer only a relatively mediocre education, but at least I can be sure I won't be risking my kids' entire futures on some untested method of 'education' that someone I don't know claims could be better!" Let me first note that Sonlight Curriculum has been around for 15 years. And, as you will see on page 149, many of our students are graduating and moving on toward college. And not just run-of-the-mill colleges, but some of the top universities in the nation. 3. "Frankly, I'd be scared to teach my kids. I don't know enough! How would I know if what a book says is true or 'made up'? And how can I be sure I'm covering everything my kids need to know?" But beyond that, you'll find that our Instructor's Guides — the guides that cover History, Read-Alouds, Readers, and Bible — include incisive questions and large quantities of vital information that will help you give your children a more balanced perspective on almost everything you read — and they will help you answer questions your children may ask. So, for instance, in the Sonlight D guide you'll find an article that discusses who really "discovered" America. (Hint: it wasn't Christopher Columbus.) And in the G guide you'll find a note that explains some of the shortcomings of Susan Wise Bauer's Story of the World. We would love it if you'd allow us to show you how exciting and enjoyable Sonlight's literature-based curriculum can be. We would love it even more if we could provide you with such a positive homeschooling experience that you feel compelled to tell us your success story next year.